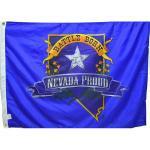 Show them you're Nevada Proud with our 3' X 4' Nevada Proud flags. Made of SolarMax nylon and finished with reinforced canvas header and two brass grommets. Has four rows of stitching on the end of the flag. 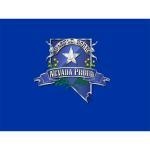 Nevada Proud flags were created and produced by our graphics staff and 100% made in America. 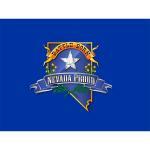 Designed and created by us, right here in Sparks. These beautiful trademarked decorative flags are 28” X 40” and are doubled sided, meaning we made two flags and sewed them together so they read correct on both sides of the flag. 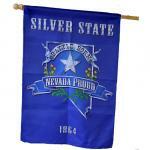 Flags are finished with pole sleeve at the top with sewn in tabs. 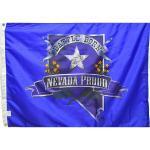 Flag is 12" X 18" and has our very popular Nevada Proud graphic imprinted on the flag. Flag reads correct on one side and mirror image on the other side of the flag. Finished with reinforced canvas header and two brass grommets. 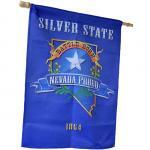 Designed and made by our company right here in Nevada.